RAMSTEIN AIR BASE, Ger­many, April 26, 2011 — By many accounts, 20-year-old Army Spc. Dustin Mor­ri­son is a liv­ing mir­a­cle – and a tes­ta­ment to the mil­i­tary med­ical sys­tem that’s get­ting med­ical care to wound­ed war­riors and mov­ing them to pro­gres­sive­ly advanced lev­els of care faster than ever before. Mor­ri­son, an Iowa Army Nation­al Guards­man, was severe­ly wound­ed April 11 when his mine-resis­tant, ambush-pro­tect­ed vehi­cle struck an impro­vised explo­sive device in east­ern Afghanistan’s Pak­tia province. Kel­li Ped­er­sen looks on as Air Force Staff Sgt. Matthew Wor­sham, a res­pi­ra­to­ry tech­ni­cian with the crit­i­cal care air trans­port team, pre­pares her son, Army Spc. 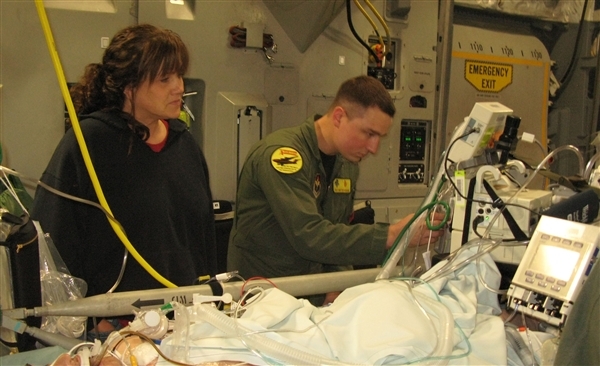 Dustin Mor­ri­son, for an aeromed­ical evac­u­a­tion flight from Ram­stein Air Base, Ger­many, April 26, 2011, for fol­low-on care at Wal­ter Reed Army Med­ical Cen­ter in Wash­ing­ton. Army Spc. Brent Maher, the vehi­cle gun­ner, was killed, and two oth­er mem­bers of the Iowa Guard’s Com­pa­ny B, 1st Bat­tal­ion, 168th Infantry, 2nd Brigade Com­bat Team, 34th Infantry Divi­sion, were injured in the attack. When Morrison’s moth­er, Kel­li Ped­er­sen, flew to Ger­many after her son was flown here, the staff at Land­stuhl Region­al Med­ical Cen­ter laid it on the line about his prog­no­sis. “They told me how very close we came to los­ing him,” she said. His lungs were so severe­ly dam­aged from the blast that the staff put him into a med­ical­ly induced coma. But after fight­ing for his life, Mor­ri­son made a break­through when began breath­ing inde­pen­dent­ly two days ago, she said. And two weeks after being wound­ed, he was declared sta­ble enough to trans­port for long-term care at Wal­ter Reed Army Med­ical Cen­ter in Wash­ing­ton. Air Force Lt. Col. (Dr.) Ray­mond Fang has seen mir­a­cles like Morrison’s every day for the past sev­en years as direc­tor of trau­ma care at Land­stuhl Region­al Med­ical Cen­ter. Bat­tle­field casu­al­ties are get­ting med­ical treat­ment faster and clos­er to the point of injury than ever before, he told reporters. Thanks to advanced aeromed­ical evac­u­a­tion pro­ce­dures, he said, patients now typ­i­cal­ly arrive at Land­stuhl for advanced care with­in three days of being wound­ed. And despite what Fang acknowl­edged have become increas­ing­ly dev­as­tat­ing com­bat injuries, he said 2010 sta­tis­tics show that patients who arrive at Land­stuhl have bet­ter than a 99 per­cent sur­vival rate. Now, as Mor­ri­son was about to move on for advanced care at Wal­ter Reed, Ped­er­sen sur­veyed the bus­tle as the 86th Air­lift Wing’s aeromed­ical evac­u­a­tion team final­ized the air­craft to receive the patients. With Air Force Capt. Anna Cho, a flight nurse serv­ing as med­ical crew direc­tor for the mis­sion, call­ing the shots, the team made final checks that the lit­ter stan­chions were secure and the tubes, cables and wires were prop­er­ly con­nect­ed to the med­ical equip­ment. Then, the team worked with chore­o­graph­ic pre­ci­sion as they began hoist­ing lit­ters from the ambu­lance and car­ry­ing the patients one by one aboard the air­craft and prepar­ing them for the nine-hour flight to Wash­ing­ton. Mor­ri­son, along with two of the oth­er most crit­i­cal patients, was the last to be car­ried aboard the air­craft, where the aeromed­ical evac­u­a­tion team secured his lit­ter into stan­chions just a foot from his mother’s jump seat. Mem­bers of a high­ly spe­cial­ized crit­i­cal care air trans­port team went to work, ensur­ing he was secured as they hooked up a ven­ti­la­tor and med­ical equip­ment they would use to mon­i­tor his con­di­tion through­out the flight. Each three-mem­ber crit­i­cal care air trans­port team includes a physi­cian, crit­i­cal-care nurse and res­pi­ra­to­ry tech­ni­cian. They’re trained to treat patients suf­fer­ing from the most severe injuries, and they’re armed with about 750 pounds of high-tech med­ical equip­ment that essen­tial­ly turns an air­craft into a fly­ing inten­sive-care unit. “What we do is ensure they have the same lev­el of care as when they were in the ICU at Land­stuhl,” explained Air Force Maj. Kirk Hink­ley, the crit­i­cal-care physi­cian for today’s flight. “That’s the whole pur­pose of a team like this: to ensure there is no step down in care” while the patient is trans­port­ed. Air Force Staff Sgt. Matthew Wor­sham, the team’s res­pi­ra­to­ry tech­ni­cian, knew he would keep par­tic­u­lar­ly busy mon­i­tor­ing Mor­ri­son dur­ing the flight. “We’re going to keep an eye on his vitals, make sure the equip­ment is oper­at­ing prop­er­ly and that his seda­tion lev­els are right,” he said. Wor­sham said he felt par­tic­u­lar­ly grate­ful to be able to meet his patient’s moth­er. “That makes this spe­cial. You don’t always get to meet everyone’s par­ents,” he said. As the ramp raised and the air­craft engines fired up, Wor­sham knew he was in for a long, demand­ing mis­sion – but he said he wouldn’t trade the oppor­tu­ni­ty to care for Mor­ri­son and his fel­low wound­ed war­riors for any­thing in the world.